Disclaimer: Obviously, this is a speculative what-if out of intellectual curiosity and by no means condones narcotics and their creation. The logo of Breaking Bad had it been bio. Half the issues in Breaking Bad could have been solved if they had been using biocatalysis and metabolic engineering. The catch is that nobody has made a production strain and it is not a simple task. Some time soon, biocatalysis and metabolic engineering will replace many heterocatalytic processes as it is more efficient, cheaper, safer and greener. Worldwide, there is a big problem of exploding methamphetamine labs. This problem could be fixed by switching from toxic and dangerous heterocatalysis processes to green and safe biocatalysis ones. So if Walt and Jessie wanted to win the green chemistry award, what would they need to do? Their major problem is the starting material and the production steps. So the whole lot. Therefore, they need to do metabolic engineering. The major issue is that methamphetamine is not a natural compound, so extensive engineering would be needed to produce the final steps. However, once they laboriously made a production strain, they would need to set up a large-scale bioreaction, i.e. a brewing tank, extract the product by phase-separation, remove the solvent and purify by crystallisation as they normally do. Then the only worry then is that they may be as contaminant-prone as Hank is at brewing. Methamphetamine is a compound that looks like phenyalanine, but on the chiral α-carbon there is methyl group instead of a carboxyl one and the amine group is methylated. 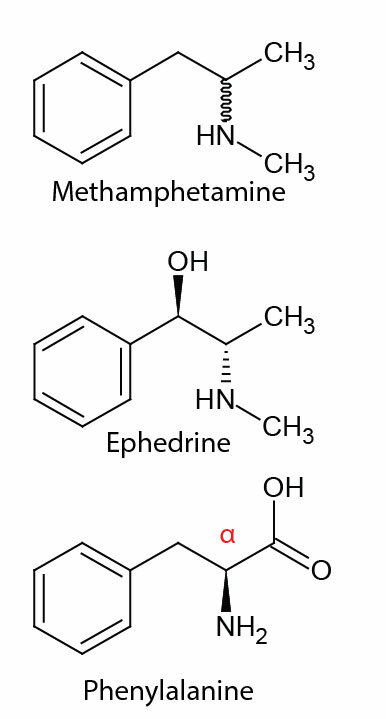 The natural molecules most similar to methaphetamines are pseudoephedrine and ephedrine. These two diastereomers differ from the former in having a hydroxyl group (in different chiral orientations) on the carbon adjacent to the benzene ring. The biosynthetic pathway is known (PMID 22502775), but requires eleven steps, which have not been assembled exogenously in an orderly way. Additionally, to convert ephedrine to methamphetamine new enzymes need to be engineered for the hydroxyl reduction, which is problematic. Consequently, ephedrine biosynthesis might not be the best route and instead something more radical may be in order. Ephedrine gets its name from the genus Ephedra, whose members produce it. Unfortunately the selective pressures for plant secondary metabolism are rather unusual (cool) and as a result the metabolic routes get a tad tortuous. 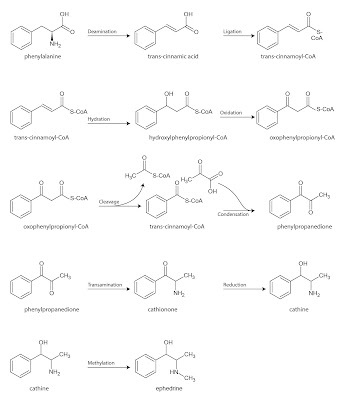 If one were to forget how plants like to do things, one would guess a simple pathway with a similar logic to threonine biosynthesis be present. Namely, the carboxyl is twice reduced and the remaining hydroxyl is isomerised to the right place. The final step (not pictured), the N-methylation, would be simply accomplished by a SAM-dependent methyltransferase and is the only part that is correct. In the isomeration step, one might anticipate that an enamine-ketimine tautomerism followed by an attack by water might occur ruining the effort. However, the isomerisation of homserine to threonine is done via a PLP enzyme which holds the amine, so this isn't the problem. The problem is plants like to make second metabolism in an OCD way, starting from specific compounds (e.g. geranyl-PP, farnesyl-PP, cinnamoyl-CoA, coumaroyl-CoA, malonyl-CoA and acetyl-CoA), preferably using decarboxylative condensation. 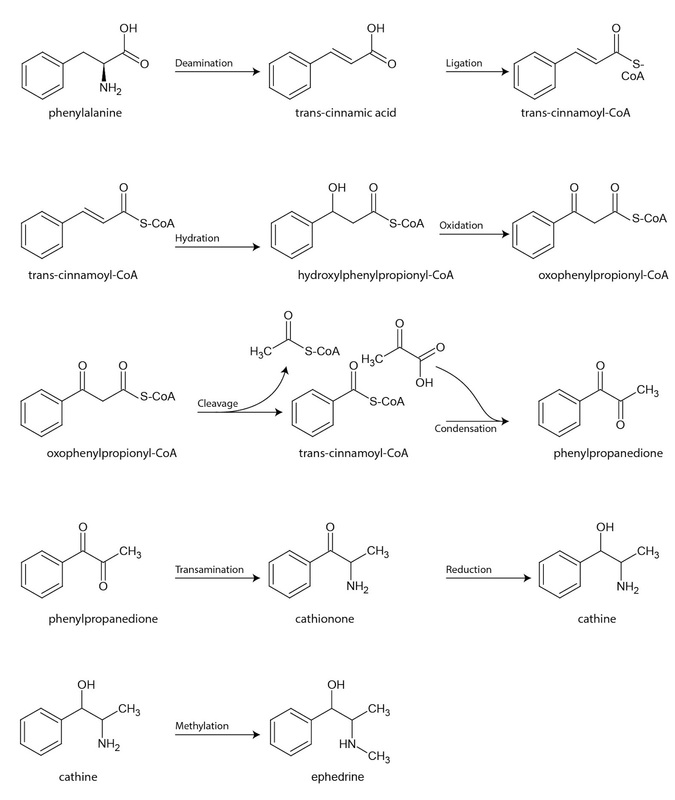 The ephedrine pathway is no exception and shares the beginning of the pathway with many other compounds Phenylanine > cinnamic acid > cinnaomyl-CoA>>benzoyl-CoA. Then the unique part is that the benzoyl-CoA is condensed with pyruvate, reduced and transaminated. In reality, whereas the full pathway is known, the genes themselves are not, simply because nobody has sequenced E. sinica. Although a group in 2009 has gone to the effort of making yeast take up the DNA of E. glauca via ion implantation —no kidding around there!— and make ephedrine, but they did not sequence a few hybrids or similar, but instead did a lot of tedious work with primers (PMID: 19280123). Consequently, their experiment would need to be repeated, but with sequencing. Once the various genes are cloned into E. coli, preferable into a strain that overproduces phenylalanine (eg. from PMID: 17880710), the pathway would be optimised, giving an ephedrine-producing strain. The last step is the trickiest. After those few years of work are done, the hydroxyl needs to be removed. Biochemically, hydroxyl groups are normally removed in two steps, the hydroxyl group is removed without adding an electron pair to the molecule by a hydroxylase, therefore leaving a double-bonded carbon, which is then reduced by a reductase. In some rare cases, the hydroxyl is reduced away. The most famous example is ribonucleotide reductase. The mechanism is rather mental and ugly. The dehydration route is a problematic option however. A modified 3-hydroxyacyl-ACP dehydrase and the enoyl-ACP reductase from the fatty acid biosynthetic pathway seem like good candidates. However, the dehydrated enolamine would spontaneously tautomerise and hydrolyse as mentioned above. This might not be that catastrophic as the product would be phenylpropanone, which being similar to phenylpropane-dione, the product of the pyruvate-benzoyl-CoA condensation. It might be promiscuously transaminated again by the cathionine transaminase or by phenylamine transaminase. Nevertheless it is an odd way of doing things. The N-methylation must be done last as the product is slippery being so hydrophobic. Normally, biochemistry likes to put a handle to hold stuff like that, such as phosphates, CoA and glycosides. In this case, a N-glycosilation would be a good option. The best bet, however, would be to move the N-methylation step after the hydroxyl reduction, the methyltransferase cannot discern between the precursor for ephedrine or pseudoephedrine, so it is probably fairly accommodating towards amphetamine. The carboxyl group needs to be replaced with a methyl group. This is not an option from a biochemists' perspective as C-C bonds cannot be made that easily, unless by condensation or transmethylation on aromatic structures. In a typical methyltransferase the methyl donor is SAM, while the acceptor is a nucleophile (Lewis base), such as an amine or a hydroxyl that has been deprotonated by a catalytic acid. From a technical point of view as far as I can tell there should not be anything forbidding a PLP and SAM dependent decarboxylative C-methylation. After a decarboxylation the negative charge is partially absorbed by the PLP (electron sink), leaving an nucleophilic secondary aldimine. The enzymatic reside that favoured the departure of the carboxyl group (say, catalytic lysine) might compete with the SAM though. A side question is how to select for better variants. To evolve a strain to make methamphetamine an way to select for one is obviously needed. The traditional way would be to assay for those compounds by HPLC, but this would mean that the variants would be screened laboriously (especially in light of the optimisation required). An option for a high-throughput approach is to make a transcription factor that responds only to the substance needed, so that it activates a fluorescent reporter which can be selected by a FACS (eg. PMID: 22276138). Unfortunately, the targets of amphetamines and those of catecholamines are membrane receptors. So the phenylalanine binding TF, tyrR-econded, would be a good candidate for engineering. The oral murine LD50 of methamphetamine is slightly higher than capsaicin (55 vs. 46 mg/kg), so it is probably non-toxic to bacteria and due to its hydrophobicity it can be phase-separated easily from the aqueous environment. So a least one bit would be straight-forward. And it would be expensive to do and there is no guarantee that their strain would remain safe — copying Walter's formula was an issue, here it would require only a stolen tube.